Over the past five to 10 years research facility design has been adapting to changing laboratory practices. Today’s modern laboratory, especially in the life sciences, operates with fewer fume hoods due to the prevalence of microchemistry, or the use of minute quantities of chemicals, and computational chemistry. Additionally, thermal loads in laboratories have dropped due to the reduced plug loads of more energy efficient equipment such as LCD monitors instead of CRT’s, more efficient freezers, and higher efficiency lighting. The result of all these changes is that the minimum air change rate is now often the dominant or controlling factor for determining average, and in many cases, design values for supply and exhaust air flow volumes in laboratories. While acknowledging the increasing importance of this factor, there continues to be great debate over the correct value for the minimum air change rates (ACH) for laboratories. Air change rates are often set to a single value between six and 12 ACH for a laboratory with no hard guidelines or standards to rely on. The truth is there is no single correct rate of air changes for even a specific laboratory room. The dynamic nature of any individual laboratory space precludes that one “correct” value is appropriate at all times or for all conditions. The “correct” value varies based on the specific conditions of the laboratory at a given point in time. For example, if a spill of a solvent or volatile chemical occurs, or chemists are doing work on a bench top that should be done in a hood, a higher room air change rate is desirable. In a spill situation, a rate far above 6 or 8 ACH’s, such as 16 ACH’s, can provide superior dilution performance at the time of the incident and for a period of time afterwards. When the situation calls for it, a higher air change rate is much more effective in reducing contaminant levels quickly. However, the majority of the time, under normal operating conditions, laboratory room air is typically clean, and a minimum of 2 ACH would be “correct”. Diluting clean room air with clean supply air achieves no benefit and wastes significant amounts of energy. Consequently, the best theoretical approach regarding minimum air change rates for laboratories would be to determine the rate based on the real-time quality of the air in the laboratory. This would allow airflow in a laboratory to vary based on all the situational factors affecting laboratory airflow, as opposed to only the status of the hoods and the thermal load. Implementing a dynamic approach to controlling minimum air change rates requires the ability to measure a unique set of indoor air parameters, such as total volatile organic compounds (TVOCs), particles, carbon dioxide, and humidity and to integrate this information with the building management system. Until now such an approach similar to demand control ventilation (DCV), but applied to laboratories and vivaria, has not been feasible or cost effective primarily due to the quality and quantity of sensors necessary to safely implement this approach. In addition, the associated calibration and maintenance costs rendered it impractical to populate a large number of sensors throughout a facility. A new sensing architecture has been developed that can now implement the dynamic control of laboratory room air change rates in a practical, reliable, and cost effective manner. This new sensing approach changes the age old paradigm of sensing and minimizes calibration and maintenance expenses. 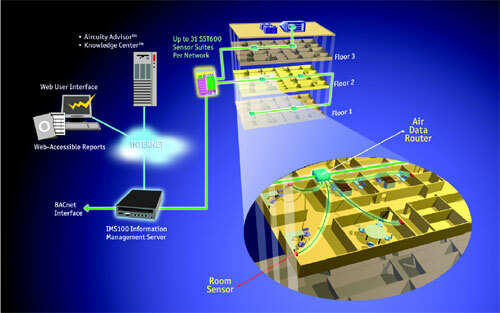 Instead of placing multiple sensors in each sensed space or area of a building, this networked system routes packets or samples of air sequentially in a multiplexed fashion to a shared set of sensors. Every 40 to 50 seconds a sample of air from a different area is routed on a common air sampling backbone to the same set of sensors, known as a sensor suite, for measurement. These sequential measurements are then “de-multiplexed” for each sampled area to create distinct sensor signals used for traditional monitoring and control. Typically 15 to 20 areas can be sampled, with one set of sensors, approximately every 15 minutes depending on the requirements for those spaces. Calibration and maintenance expense is minimized due to the limited number of sensors and their centralized grouping in one location. The calibration process is easily accomplished through an exchange program whereby a set of factory calibrated sensors from the manufacturer periodically replaces the onsite sensors, such as every six months. The system is therefore assured to operate at peak performance with minimal, or no disruption to the facility’s operation. A key innovation in this multiplexed sensing system is the development of a structured cable containing low voltage power and signal conductors, data communications, and a unique, one quarter inch hollow conduit. This sample conduit provides the transport media through which the air packets are passed one after another, similar to data packets on the communications network used in building management systems. To substantially eliminate air packets from contaminating subsequent packets, the inner walls of the air sample conduit are made of a mixture of an inert fluoropolymer and a unique nanotechnology material known as carbon nanotubes. These micron-long chains of carbon atoms form inert, electrically conductive strands that, when mixed with the plastic fluoropolymer, form an electrically conductive matrix that prevents the buildup of static charges that might impede the flow of particles and aerosols. The resultant sample conduit can accurately transport and preserve the air sample’s properties to support accurate measurement up to 500 feet away from the centrally located sensor suite. This multiplexed sensing approach (Figure 1) can measure almost any air parameter of interest. For laboratories, the use of a PID, or photo-ionization detector type of TVOC sensor is very beneficial for accurately detecting literally hundreds of commonly used laboratory chemicals that can volatize and become a safety concern. Combining this sensor with a laser-based particle counter to identify aerosol vapors, plus other specialty sensors affords detection of the majority of airborne chemicals of concern. In this dilution ventilation control concept, when an increase in contaminants in a space is detected, the airflow in the room is increased as appropriate up to a maximum level such as 15 ACH or the design capability of the room’s airflow control devices. The lower value of the dynamic range when the air in the laboratory is “clean” can be set to 4 ACH (Occupational Safety and Health Administration or OSHA guidelines recommend 4 to 12 ACH)1. For additional savings, a nighttime or unoccupied level of 2 ACH can also be implemented. For less critical laboratories or support rooms, 2 ACH could be used as the minimum level for all times. Although a value such as 2 ACH’s at first glance might seem low, analyzed further, it is more than three times the typical occupied office outside air ventilation level. It is important to note that no set of sensors will detect every possible compound that can be used in a laboratory. However, with the sensors previously described, the vast majority (90 to 95 percent) of the chemicals of concern will be detected allowing the air change rate to be appropriately increased. As a result, for the vast majority of spills or chemical releases it is preferable for safety reasons to increase a laboratory’s airflow rate from 6 or 8 ACH to 15 ACH. The remaining 5 to 10 percent of the time, when a chemical release is not detectable, the laboratory will still operate at the OSHA minimum guideline of 4 ACH. Varying air change rates as the situation demands thus provides a better overall approach compared to operating at 6 or 8 ACH all the time, regardless of whether a spill or accidental release of chemicals occurs in the laboratory. The graph (Figure 2) illustrates the significant benefits of operating at higher ACH rates during a spill. Figure 2 illustrates what happens during a National Institutes of Health (NIH) handbook dilution ventilation test2 of spilling a 1.5 liter container of acetone on the floor of a single 200-square-foot laboratory module with a 10 foot ceiling. For this analysis we assumed a spill of 1 square meter in size, and a typically used value of 3 for the room’s mixing factor or K.
The figure of merit evaluated by NIH is the length of time it takes to reduce the solvent vapors to a safe level (shown in the above figure as 750 PPM or the threshold limit value (TLV) of acetone) after evaporation of the solvent. The blue curve in the graph shows the performance achieved by a constant baseline value of 6 ACH which reaches the 750 PPM threshold about 60 minutes after the spill and has a peak value slightly over 5,000 PPM. 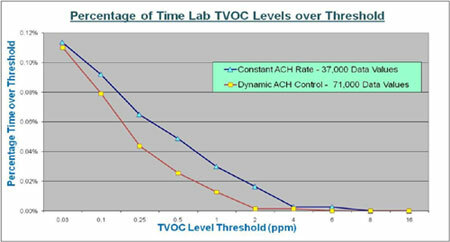 The performance of the dynamic air change rate control approach is shown in the figure by the yellow, purple, and red curves where the minimum air change is 2 ACH before detection of the acetone spill and 15 ACH after detection to purge the room. The difference in these curves represents the difference in performance when a spill is detected in five minutes (yellow), 10 minutes (purple), or the worst case situation of 15 minutes (red). The red curve in particular shows that even with a system cycle time of 15 minutes and a worst case detection therefore of 15 minutes, the system performance is still much better at all points than the 6 ACH baseline. In fact, even with the worst case red curve, the peak value is reduced to 3,675 PPM and the clearance time to the 750 PPM threshold is only 20 minutes after evaporation or one third of the baseline 6 ACH performance. Even more interesting is that even after 120 minutes, the 6 ACH baseline approach is still at 302 PPM, whereas the worst case dynamic system performance has reduced the background level of acetone vapors to only 2.6 PPM. This is a performance improvement of over 115 times in terms of dilution vs. the constant 6 ACH rate system. Regarding vivaria, this approach is an excellent means to both safely vary and often reduce air changes, while providing real time monitoring and documentation of the quality of the room environment in which the animals are housed. Air quality problems that could affect research results can be quickly detected and remedied before the animals are substantially impacted. The ability to reduce an animal room’s air changes from perhaps 10 or even 20 ACH to 6 or 8 ACH is not only now practical but allowed. The Institute for Laboratory Animal Research (ILAR) guide used by the Association for Assessment and Accreditation of Laboratory Animal Care (AAALAC) for vivarium accreditation permits lower air change rates as long as good, or specifically non-harmful levels of room air quality are maintained. In particular, the ILAR Guide to the Care and Use of Laboratory Animals is a performance-based standard that specifically states that fixed air change rate guidelines such as 10 to 15 ACH although being generally accepted, “…might pose a problem by over ventilating a secondary [room] enclosure that contains few animals and thereby wasting energy or by under ventilating a secondary enclosure that contains many animals and thereby allowing heat and odor accumulation.”3 Additionally, the ILAR Guide states that lower room ventilation rates can be appropriate, “…provided that they do not result in harmful or unacceptable concentrations of toxic gases, odors, or particles in the primary [animal cage] enclosure.”4 By directly measuring and controlling room particle levels, as well as odors/TVOC’s and ammonia, good room air quality levels can be maintained energy efficiently. This system also generated a net reduction of first cost in the GreenLab project. For the 75,000-square-foot laboratory area, a gross reduction of approximately $1,025,000 of HVAC system first cost was achieved by reducing the minimum air change levels in the laboratories and using a more realistic thermal load assessment. The result was a reduction in the design capacity of the HVAC system from supplying all laboratories simultaneously with approximately 16 ACH of air flow to a reduced level of 9 ACH. In total the gross first cost reduction in the HVAC system (air handlers, exhaust fans, furnace, VFDs, and chiller) was approximately $13.68 per square feet of laboratory space. 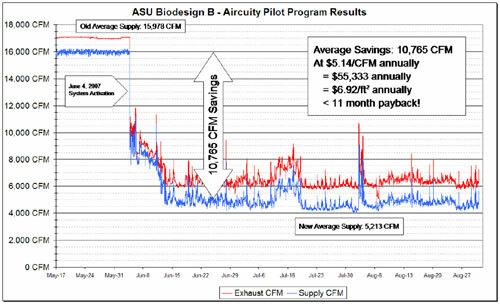 An installed case study example of this approach can be seen at the new Biodesign-B building at Arizona State University that was recently certified as a LEED® Platinum facility. A pilot project to dynamically vary air changes using multiplexed sensing was installed as a retrofit in mid 2007. The building was initially designed with a minimum ventilation rate of 12 ACH. It was decided to reduce the air change rate by a factor of three down to 4 ACH when the laboratory is clean, and to increase the airflow to between 16 to 18 ACH when contaminants are sensed in the laboratory. Figure 3 shows the results of this control approach for 11 laboratory rooms. The energy savings from this approach are quite significant as shown with a payback of less than one year even using conservative energy numbers. The rest of this building as well as ASU Biodesign A is now also being retrofitted. With a total gross floor area of 330K square feet the savings of this project are estimated to be about $1 Million annually. To put this in a green perspective, this savings is approximately equal to the power generated by a 4.5 MW solar PV array that would cost over $30 million to install and would take up 450,000 square feet of roof space or over 11 acres. Another interesting aspect of the pilot as indicated in the graph in Figure 3 is that the laboratory airflows initially did not reach the final level and for two weeks were higher than expected. This turned out to be caused by thermostats that were open to the wall cavity. As a result the negative laboratory environment drew warm wall cavity air into the room through the thermostat causing incorrect readings and overcooling the room. This preexisting problem had not been noticed before. However, when the thermostat openings were sealed over a two week period the airflows dropped to the final levels shown. As seen in this example, dropping laboratory airflows typically points up some existing problems that often with some retrocommissioning efforts can ensure both the expected savings or find pre-existing problems that were causing additional energy waste. In terms of the safety impact of the new control approach on the laboratory, Figure 4 shows the cumulative average level of TVOC’s in the ASU laboratories both before and after the retrofit was completed. As can be seen by the data even though the normal minimum laboratory air change rate was reduced by a factor of 3, the ability to significantly increase the air change rate above the previous minimum rate rapidly purges the laboratory when contaminants are detected. This resulted in a significant reduction of VOC contaminants in the laboratory areas as shown by Figure 4. In addition to safely saving energy in laboratory and vivarium facilities, Multiplexed sensing technology can also be used in non-laboratory areas such as offices, classrooms, healthcare facilities, and many other buildings where the control of outside air is important to save energy. Strategies such as demand control ventilation and other outside air control approaches such differential enthalpy control that can require significant numbers of sensors can now be applied accurately, cost effectively, and reliably for all types of facilities. Occupational Safety and Health Administration (OSHA) 29 CFR Part 1910.1450. Washington, D.C.: U.S. Government Printing Office, 2001. p.492. National Institutes of Health Design Policy and Guidelines Office of Research Facilities. Spring 2003. Mechanical F.64-67. (and 4) Association for Assessment and Accreditation of Laboratory Animal Care. Guide for the Care and Use of Laboratory Animals (NRC1996). p.32. Gordon P. Sharp is the founder and chairman for Aircuity, Inc. Mr. Sharp is also the founder and former CEO of Phoenix Controls and has more than 25 U.S. patents to his name.